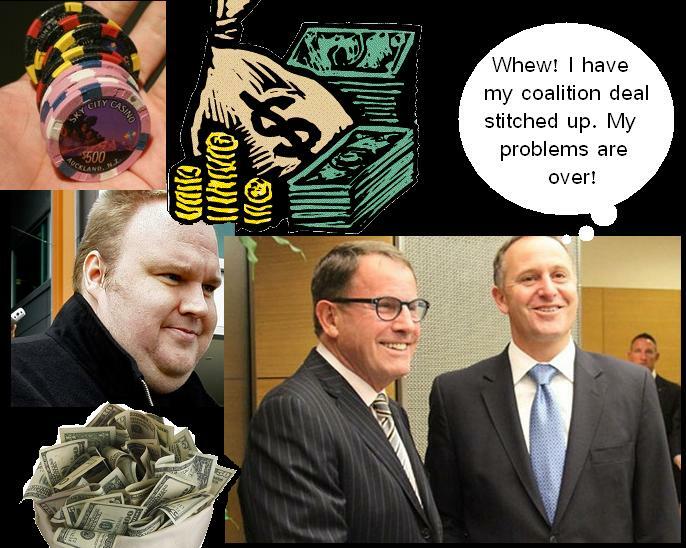 John Banks – Demented or Slippery as an eel?! Is it Wackydoodle time already? This was either a very weak attempt at deflection – or John Banks is losing the plot as the pressure of public and media scrutiny bear down on him. 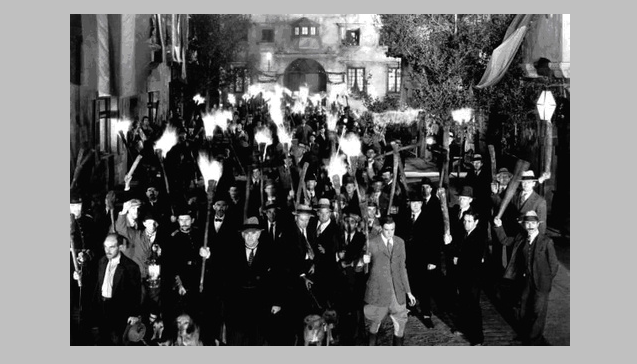 Whichever – I wonder how many of the 15,835 Epsom voters to cast their ballot for Banks are now regretting it? They’ve elected a clown who plays footloose with campaign-donation laws and is trying desperately to cover his arse. Key on Banks; Staunch, stupid, or stuck? One of the Golden Rules of politics is: learn to count. This refers to everything from passing legislation to votes of confidence. In short, it means if you don’t have the numbers in government, you might as well call it a day and hand power to the Opposition (or call a snap election). Counting especially focuses the attention of parliamentary leaders such as Key and Gillard, who have (respectively) one and two seat majorities in their respective Parliaments. It means, also, that if a government has a generous majority, it can afford the luxury of holding their own Ministers to account and make grand exhibitions of standing down those who have done something naughty. Conversely, if a government has only the slimmest majority, that same government will hang on to, and defend to the bitter end, any errant Minister or MP. Richard Worth was Minister of Internal Affairs, Minister for Land Information, Minister Responsible for Archives New Zealand, Minister Responsible for the National Library, and Associate Minister of Justice, in the Fifth National Government. In March 2009, reports emerged that Worth’s trips to India were a conflict of interest. It was alleged he spoke on behalf of the Government while engaging in private business deals. On 3 June 2009, Prime Minister John Key announced Worth’s resignation from his Ministerial portfolios, after several allegations of inappropriate behaviour toward woman. On 12 June 2009, Worth announced his resignation from Parliament. In October 2010, Richard Worth was appointed to a diplomatic role, “to the surprise of the prime minister”, as Monaco’s honorary consul to New Zealand. Former National Party politician. Ms Wong was New Zealand’s first Asian MP, serving as a member of parliament for the National Party from 1996 to 2011. She was also the first Asian Cabinet Minister, with portfolios; Minister for Ethnic Affairs, Minister of Women’s Affairs, Associate Minister for ACC, and Associate Minister of Energy and Resources in the 2008-11 National Government. In November 2010, it was alleged that Ms Wong mis-used Parliamentary travel funds so that her husband could conduct private business in China. On 12 November 2010, as allegations surrounding her and her husband’s mis-use of Parliamentary funding were investigated, Pansy Wong stepped down from her Ministerial portfolios. “It found that one trip, a flight from Beijing to Lianyungang, China in December 2008, could have been in breach of the Speaker’s Directions,” Speaker Lockwood Smith said in a statement. Dissatisfied with the Speaker’s investigation, Labour MP, Pete Hodgson, called for the Auditor-General to carry out an inquiry into Mrs Wong and her husband’s use of the travel allowance. Eleven days later, on 14 December, Ms Wong made her decision and resigned from Parliament. However, Heatley did not resign from Parliament, and regained his Ministerial portfolios about a month later. Allegations of not disclosing the sources of campaign donations have been made against John Banks. These donations were made by Sky City and web entrepreneur, Kim Dotcom. In the case of Sky City, Mayor Len Brown received a similar amount of $15,000 from the Casino, and Brown later formerly declared it. John Banks listed his $15,000 donation as “anonymous”. It appears that John Key’s previous standard of accepting Ministerial resignations, whilst investigations are carried out, no longer applies. A difference in majority of 15, I would guess. The Herald noted that Mr Banks has not been returning their calls. So much for not hiding or being fearful. PS 2; Police have confirmed they have received two complaints over “anonymous” donations made to John Banks during the 2010 mayoralty campaign. 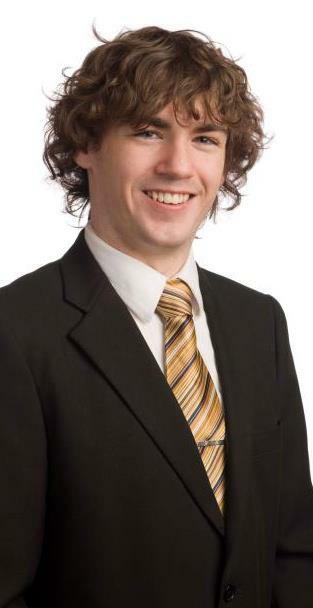 This online interview is with Hayden Fitzgerald, current President of ACT on Campus; ACT Party Board Member for Central Region; and ACT Candidate for Rangitikei in the 2011 Election. Q: You’re the current President of ACT on Campus and stood as a candidate in the last election; how long have you been a member of ACT, and what attracted you to that Party – as opposed to, say, another Party? I was originally a Green Party fan, switching to National as I studied more economics. I became dissatisfied with National’s failure to act upon the areas it identified as problems while in opposition so switched across to ACT early last year. Q: What has been your personal best experience with ACT thus far? I thoroughly enjoyed the experience of representing ACT as the Candidate for Rangitikei. Q: How do you feel about ACT’s numbers dropping from five to just one MP at the last election? I think it’s really sad to see ACT’s numbers shrink so much but ACT’s campaign was far from perfect so I think it was predictable. Q: If ACT goes the way of The Alliance, which other Party do you think would be the natural home for ACT supporters – National? Personally I don’t think there is a natural other home for ACT supporters. A large majority would likely go to National but others wouldn’t. I think if ACT was to disappear another party similar would rise up to fill the gap before long. Q: Do you think ACT can re-build its electoral support? Or do you feel that ACT is a “tarnished brand”, and a new liberal party is required with a fresh look to it? There’s no doubt that the ACT brand is damaged but I think the support base can be rebuilt if the Party sticks to its core values. A complete rebranding of the Party could be something worth considering but the cost of doing so may not outweigh the cost of repairing the current brand. 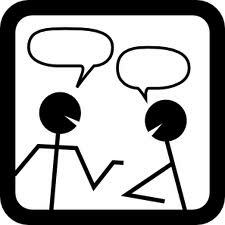 Which direction you think ACT should take here will differ depending on who you talk to! Q: What are your thoughts on ACT’s recent leadership changes and what impact, if any, do you think they had on ACT’s support? Referring to John Banks I think it was something that had to happen. Having your only MP as the leader of the Party is really the only practical option. I don’t think it has influenced the support base of the party much. The next three years will determine. Q: If you had been casting a vote for ACT’s leadership, who would you have supported, Rodney Hide or Don Brash? Q: Why is that? What are the qualities that you believe Don Brash had, but not Rodney Hide? Fresh face; one would have thought he would have brought a lot of existing popularity with him. Q: There have been suggestions that Heather Roy could have made a good leader of ACT. Do you agree with that? If she had been leader, do you think she could have attracted a greater share of the womens’ vote? I think Heather is a lovely lady who made a very good politician. I think that she could have contributed a lot as a leader of ACT and no doubt the women’s vote would have increased if she were leader. However, the same would be true of many others. Q: Do you have a top three list of priorities that ACT should focus on, this Parliamentary term? Choice, Personal Responsibility and Limited Government. Q: Have you read or heard of Gareth Morgan’s “Big Kahuna”, and his proposal for a Universal Basic Income/negative tax for the first $11,000? Yes. Personally I favour a tax free threshold of $30,000 and a flat 20% after that with GST kept at 15% and no company tax. Q: But no negative tax (or Universal Basic Income as some call it)? There would definitely have to be some form of “Universal Basic Income” in the way of a safety net. We just have to be careful not to create incentives not to work. Q: Recently, US billionaire Warren Buffett highlighted how he paid tax at a much lower rate than his own staff, who, in many instances were paying roughly double the rate he was. What do say to people like Buffett who state that the rich are not paying their fair share in taxes? Or do you agree with him? With a simpler tax system, as I identified above this sort of thing would not happen. This is also an American example. This doesn’t happen to the same extent here in New Zealand. Q: New Zealand has a fairly free market economic regime compared to, say, the Scandinavian countries. Yet places like Finland and Denmark, notable social-democracies with strong welfare systems and state services, have a high PPP per capita income to New Zealand. Why aren’t we light years ahead of the Scandinavians – especially after 27 years of reforms? I think it’s very hard to compare New Zealand’s economy to these as we’re so different. Q: Oh, in what way? What do you think are major differences? Different climate, population and distance from other countries. Truth is I don’t know much about these economies but I do have a friend who lives in Finland that isn’t too fond of the way things are run. Q: What, if anything should we be doing different? Simpler tax system, smaller Government. Q: State funding of private schools? Or should they be left to succeed or fail on their own merit? I favour the voucher system, so parents can send their child to whichever school benefits their child the most, be it public or private. Q: But would you allow a private school to fail and go into liquidation, if it got to that stage? Yes; I don’t support Government bailouts. Q: The minimum wage? Especially when Bill English said on Q+A that it was extremely difficult to live on the minumum wage for any long period of time? The problem with minimum wages is that they harm the very people they’re supposed to help. I also question whether or not it is up to the Government to decide what an individual can and cannot work for; should it not be up to the individual to decide what a fair wage for them is? I also note that the current minimum wage equates to a lot more than being on social support. Under a simpler tax system with a high tax free threshold low income people would be a lot better off as they would pay no tax. Q: In what way do you think a minimum-wage harms people? Locks them out of employment; particularly young people. In theory there is no need for a minimum wage. The minimum wage is equivalent to the safety net that is provided; currently just under $5 an hour. Q: The Auckland waterfront dispute? What are your thoughts on how Labour and National have responded to this issue? 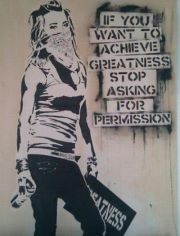 Or should they not intervene? I don’t think the Politicians should intervene in these issues. Q: The partial sale of some SOEs? Should New Zealanders be given first option to buy shares, or should the IPO be made available to any/all without any restrictions/criteria at all? I’m fine with all New Zealanders’ getting first option. Q: The sale of productive farmland to overseas investors? Foreign investment is extremely important to our economy. We also invest a large amount of money overseas. If we want to maintain our free trade agreements we cannot discriminate against foreign buyers. It also raises an issue around property rights; should you not be allowed to sell something you own to whomever you choose? Q: Mining? Especially of conservation lands? Cost vs. benefit analysis. I’m generally against mining of conservation lands but we must weigh up how much damage would be done to how easy it would be to repair it etc. I’m skeptical but willing to be persuaded. Q: Deep sea oil drilling? Especially after the ‘Rena’ stranding? Are we adequately prepared? The Rena was a boat whose Captain wasn’t following the rules; as such the company who own the ship and their insurers should be taken for the full cost of repair. I think our regulations around this could do with a review; whether or not much needs changed I don’t know enough to comment. Q: Should Kiwisaver be compulsory? Should there be an opt-out option? No. Kiwisaver performance is nowhere near good enough to warrant it being compulsory. Also raises issues around freedom. It would be unfair for the Government to force me to put my own money into Kiwisaver. Q: Roads or rail? Which should have priority? That should be up to the market! Personally, I think both have a place though. Both have their advantages and disadvantages. The proper market would allocate them accordingly. Q: Free school meals – should they be introduced in all schools? Just low-decile shools? Or not at all? Not at all. Could perhaps look at doing something based upon individual applications for those in genuine need but I think the real solution is better parental education. Q: What, in your opinion, has been the worst aspect or single thing, about John Key’s government? Continuation of wasteful spending that has resulted in high debt levels that my generation will have to pay back, particularly around ignoring the elephant in the room relating to our superannuation scheme. Q: What, in your opinion, has been the best aspect, or single thing, about John Key’s government? Q: How do you feel about our current media? Do you feel that the state has a role to play in public broadcasting – perhaps to set standards or broadcast material that, while informative, might not rate highly on a commercial level? Or should it be left totally to the Market to deliver quality broadcasting? Lean toward it being left completely the market. If people want to watch it, regardless of what it is, the market will provide it. Likewise with broadcasting standards, if a tv channel is broadcasting obscene content then not many will watch it; no need for regulation. Q: And is TV3’s planned “The GC” ‘quality tv’? Probably not something I’ll watch but none the less does seem like the kind of show that would have a broad appeal. Q: If ACT was in government as the major coalition Party, and you were an MP offered a ministerial role, what portfolio would you want? And why? Tough decision. Probably Finance, Small Business, Primary Industry or Social Development as these are areas that interest me. Q: In your opinion, what is the single most critical problem affecting us as a society? How would you address that problem? And what time-frame would you give yourself? Inflated Government. I would address this by cutting unnecessary regulations and laws like the RMA, cut Government Spending and taxes and shrink all areas of the Government except core services. This could all be done very quickly but I would like to see it happen over 5-10 years as to ease transitional unemployment as people shift from public sector to private sector employment. Q: What, in your view, would constitute core services? Q: Are your friends and family political? How do you relate to those friends and family who aren’t political? Anywhere in the bottom half of the South Island. * movie and/or tv program? * prominent historical person you admire the most? And why? Roger Douglas for having the balls to do what’s right. National and Labour are the biggest obstacles to the modernisation and eventual success of our economy. New Zealanders need to wake up and stop trying to vote themselves rich. The only way to prosperity is through choice, personal responsibility, individual freedom and limited Government. Thank you, Hayden, for sharing with us! This blog is not affiliated to ACT in any way, shape, or form. Citizen Meegan’s submission to Parliament – hand’s off our stuff! Oh dear, is it that time again? Once upon a time, Farmer Joe Bloggs contracted a company to work on his farm. He needed his fields ploughed; a barn painted; several dozen stray sheep to be rounded up; and fences repaired. The company, ‘Labour R Us Inc‘ turned up on Monday morning and Farmer Bloggs explained what needed to be done. The foreman agreed to start work immediatly and discussed the tasks with his team. Very soon, the team began to disagree on which task should be done first. One worker wanted the hardest task to be done first, to get the big job out of the way. Another worker wanted the team split up to start on all the jobs simultaneously. A third worker suggested starting on the hardest and easiest job, splitting the team accordingly. Two other workers wanted a new foreman. And others agreed, disagreed, or had their own ideas on how to carry out the allocated tasks. Very soon, they were arguing so loudly that Farmer Bloggs looked out the window and saw that no work was being done, and much time was being wasted. As ‘Labour R Us Inc‘ continued arguing between themselves, the second company arrived; pulled out their tools; and set to working. Moral of the Story? Focus on what needs to be done and argue later, in your own time. Under MMP, you’re not the only show in town. Is Peter Dunne about to become the Man of the Year? The above poll is on Peter Dunne’s ‘United Future’ website and according to the earliest comment left on the page, has been active since at least 8 October, last year. The existence of that poll, plus the extraordinary 84% response, raises two interesting questions. 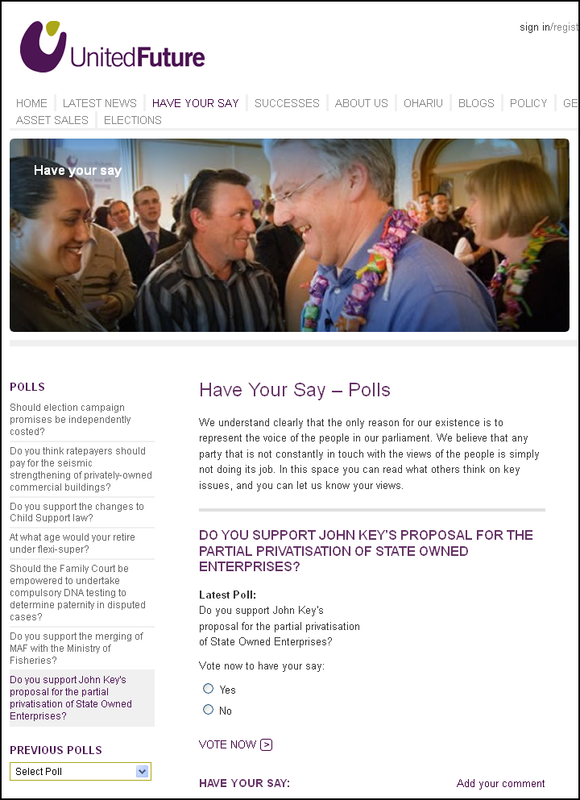 If Peter Dunne and his team went to the effort of setting up the poll; and with the overwhelming response rate opposing partial asset sales – what is it that lets Dunne believe that he has a mandate to support John Key’s programme? More importantly, why is that poll – live since at least early October 2011 – still online? Could it be that the poll’s continuation serves a purpose for Dunne, who may be re-considering his position on this issue? Could it be that Dunne may soon be issuing a public policy statement, reviewing his support for partial-privatisation, and will use feedback from his elecorate – including this poll – to oppose National’s programme? Since the election last year, Dunne has come under considerable public pressure – both from his constituents and from outside Ohariu – to cease supporting National’s asset sales. With the Aotearoa Is Not For Sale hikoi on it’s way to Wellington, Dunne may have good cause to be nervous on this issue. His constituents are well-educated, middle-class baby-boomers with a liberal bent – and are the typical voters who do not support asset sales for any number of very valid reasons. Going against your own Electorate on such a bell-weather political issue is not a particularly smart move – especially when one’s electoral success last year was dependent on another Party’s largesse. If Dunne wants to keep his political ‘branding‘ separate from National’s, he may have no option but to remove himself from the government’s coat-tails of asset sales programme. Otherwise, when National’s fortune’s really start to fall in the polls, Dunne may find himself dragged down, like a flea on a drowning elephant’s arse. Perhaps Peter Dunne – being no man’s fool, and being in Parliament for 28 years – realises all this. And if he is about to change direction and withhold support for National’s partial privatisation, then he may have single-handedly saved five state corporations from ending up in eventual overseas ownership. The entire country may honour him by nominating Peter Dunne as Man of the Year. Because sometimes, it all comes down to one courageous man or woman doing the right thing. It appears that one can’t budget, Mr Key? Of course, it’s easier to point the finger at the unemployed who’ve lost their jobs since the recession impacted on our society in 2007. Never apportion responsibility at a government who appear unable to count. It’s far, far easier to blame the solo-mums (but never solo-dads), invalids, widows, and sickness beneficiaries. After all, the Boardrooms of Goldman Sachs, Lehmann Bros, AIG, General Motors, Bank of Scotland, Lane-Walker-Rudkin, and over 40 finance companies here in New Zealand, were all run by welfare beneficiaries. May also qualify for allowances: accommodation supplement (max of $225), childcare, allowance, disability allowances ($58.13). Perhaps he and Ms Bennett should go onto the equalivalent of welfare benefits. Beneficiaries tend to know how to make ends meet living on a meagre amount of money. In fact, maybe Key and Bennett should do a straight swap – I know a few beneficiaries who could do a better job running this country. Guest Author: Citizen Meegan’s submission to Parliament – hand’s off our stuff! My name is Meegan Manuka and I am a Whanganui local here to talk to you about the purposed changes to the mixed ownership model act and the sale of our state owned assets. On the 9th of February I attended a so called, “iwi consultation” at Whanganui racecourse. And after seeing the drama that unfolded and learning what is being planned, I am concerned, very concerned. Soon after I arrived at this meeting, the drama began. We had iwi met and manhandled by police and forced away from the door, locked out and prevented from entering. The curtains were then drawn to stop all inside the venue seeing what was happening. What happened to freedom of expression? Is this country becoming a police state? This consultation was not a true and fair representative debate. The full spectrum of iwi opinion and philosophy and the voices of those iwi wanting to enter were not heard. How can national even claim to have considered the view of iwi during this “consultation” if the iwi are not even allowed in to participate in the debate in the first place? To further clarify my question, how can you claim to have consulted with and considered iwi views when some of the iwi were purposefully denied the right to participate and lend their voice to the consultation process? Their voices were NOT heard, their views were not considered, and they were not allowed to be a part of the consultation. This is twisted and unethical. Upon arrival I was given a booklet. This booklet actually. “EXTENSIONS OF THE MIXED OWNERSHIP MODEL ETC”. After leaving the meeting I set about analysing this booklet and to say it made me angry is an understatement. A lot of emphasis was put on section 9 of the SOE act both on the news and at the meeting. On page 5 of this booklet it states, “Section 9 of the SOE Act provides that NOTHING IN THIS ACT shall permit the crown to act in a manner inconsistent with the principals of the treaty of waitangi…” well this sounds fine and dandy doesn’t it… until nek minute I read this… “To proceed with the mixed ownership model, the government purposes to remove the four state owned enterprises from the ambit of the state owned enterprises Act…” which means… in reality, all this section 9 stuff is just a smoke screen and yes, you have kept section 9 in the SOE act, but that is totally irrelevant because those four companies are being removed from the SOE act anyway. This is totally misleading. Sounds good, until I read page 8… “…although trustee corporations and nominee companies that hold shares on behalf of other persons may be exempt from the ten per cent limit.” Once again you tricky monkeys… why didn’t you tell us that in the first place unless you are planning something dodgy? Now, if the waitangi tribunal says give the land to Maori the crown keeps it? We’ve seen a lot of this slight of hand politics lately and it sets a dangerous president. Politicians need to remember who pays you… WE PAY YOU… to do what we tell you to do. There hasn’t been enough REAL consultaion with the people. And I’m not only talking about the iwi consultation now, I’m talking in consultation in general. As a concerned citizen I believe that this is a rouge government and is not acting in the best interests of New Zealanders. But I guess fundamentally it’s very easy to see why. Do you not realise that by swearing allegiance to the Crown you are inadvertently NOT swearing allegiance to the people of New Zealand…and are therefore not acting in our best interests… us, the people who go to work every day to pay for the millions of dollars of debt you are incurring in our names every week??? So where does that leave us, the very people who voted you in and whose taxes pay your obscene pay rises, world trips and salaries? I’ll tell you where it leaves us, in debt… Too broke to pay for milk, can’t afford to go to a dentist…power prices going up, poisoned by polluted water and air from cancer causing fracking emissions, emissions like benzene, that are not even included in the emissions trading scheme , stuck in a never ending February 22nd, living in an unsafe green zoned house or kicked out of a safe red zoned house or fined $200,000, having our EQC claim lost for the fifth time… locked out of our work and starving for protesting about unsafe work conditions, beaten into submission by police… police who should be protecting us… while peacefully protesting the removal of our state owned home of 60 years… paying diligently towards our retirement only to find out that we are investing in a super fund that is spending our money on BOMBS and tobacco companies!!! We need to be world leaders and innovators for them, not sheep who bend over backwards and submit to the self-destructive patterns of other counties…. Instead we need to learn from their mistakes. We need to shift away from living on our land to living with it. We have to think about what sort of world we are leaving behind for our children, they are 30% of our population and 100% of our future… we need to leave some for them. I don’t know about you but I don’t want to leave them in an oily, gassy, debt-ridden, over-regulated drought of a mess that can’t be cleaned up. We need to turn this around now. I demand a transparent honest government, one that won’t trick us and will give us the opportunity to be heard and the right to fair process. One that doesn’t put the value of a dollar in their own wallets over the value of kiwi lives. One that adopts new and existing, more financially viable and environmentally sustainable technology that can reduce our emmissons by up to 80% instead of relying on over century old polluting technology. I want a government that thinks about our kids, and their future. I motion a vote of no confidence in this rouge government. And if National is so confident that they are doing what is right and they have the support of Kiwis, I also ask for a referendum about the sale of state owned assets. New Zealand, Aotearoa, everyone in this room… it is time to stand up and remind them who the real bosses are. No reira tena koutou, tena koutou, tena ra koutou katoa.